We did not want to go for a "déjà vu" café racer bike on this project. Of course the seat and tank remind you of the dogmatic aesthetic rules of what a café racer should look like. But take a closer look and you will see how different the "Tuxedo" is. The fork has been re-conditionned and comes from a Yamaha TDR 230. Front wheel shiny black powder coated. 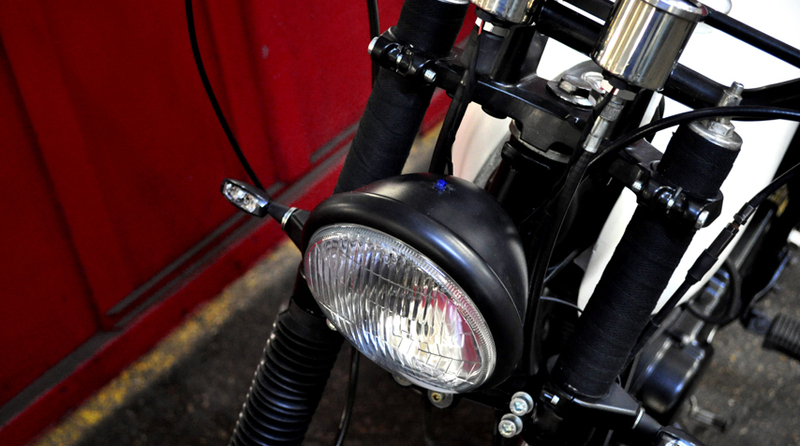 Bates headlight and mini-led blinkers. - Mikuni TM36 carburator mounted with a K&N air filter. The whole engine has been reworked: new piston rings, new distribution chain, new top-engine gaskets. Bespoke resin tank coming with a "Monza" fuel cap. Matt white painted. Firestone Deluxe tires on both front and rear wheels. - no tail light since the rear blinkers include stop + tail light.